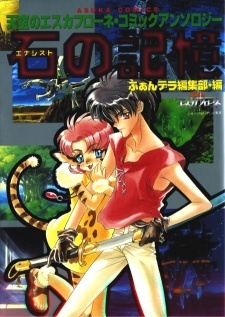 Different manga artist across Japan joined in this collaboration of 15 mini stories connected to the anime Escaflowne. Most stories in this are humorus, but some are serious. Escaflowne is about a girl, Hitomi, pulled into another world called Gaia, and there she meets a refugee prince named Van. Together with a legendary armor called Escaflowne, they try to put things to right.